The original article I found on Wired Magazine's UK site. I was very impressed with the data rates the NASA and MIT teams were able to achieve when being challenged with the effects of Earth's atmosphere on the laser beam. I found this on the Flightaware.com forum. The author of the blog is a pilot who has taken photos of various airport runways. For me, there is an aesthetic that is very zen. 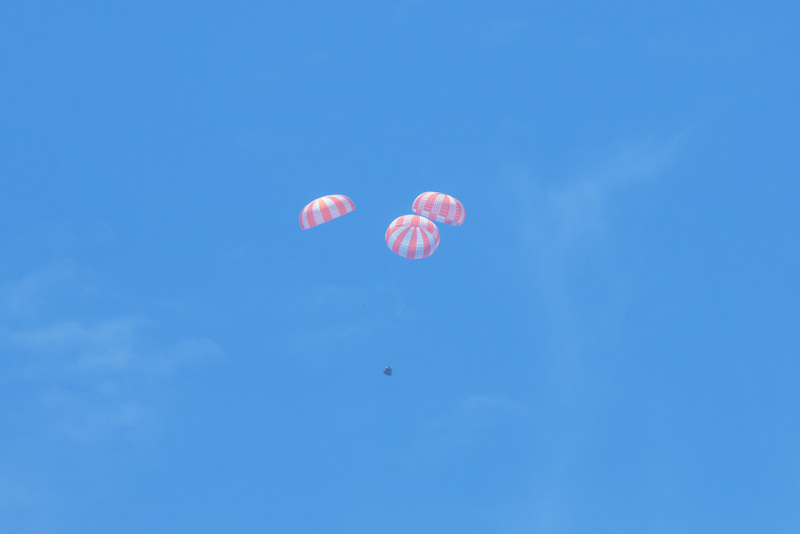 Beautiful photo of the SpaceX Dragon spacecraft as it returns to Earth with cargo from the International Space Station. Here's a link to the NASA press release. Disabling the Network Adapter Improves Graphics Rendering . . . Say what? This video from YouTube makes me laugh. My wife found this and it is too cute for words. A gopher has made its home near one of the Russian Space Agency's launchpads at the Baikonur Cosmodrome in Kazakhstan. Discovered that setting up Gallery3 on my server which uses Windows 2008, IIS7, and SQL Server; is a non-starter. I have to go back to Gallery2. This is not a bad thing, but still a little disappointing that the Gallery Team has decided for Gallery3 they will no longer support a Windows Server and IIS installation. I'm finally done with the updates to my blog. Yay! Updating from BlogEngine 1.3 to 2.6 plus the customization work for the DarkBlog theme took a bit of time. As an added note, I found that if one chooses to use the DbBlogProvider as the blogProvider and blogSystemProvider fields of the Web.Config; verify that the applicationName in the membership and roleManager fields match the entry in the dbo.aspnet_Applications table in the BlogEngine database. Otherwise, logging into the blog after an upgrade will fail. I found that out the hard way. But, the blog is finally up and operational. I just hope my posts will be helpful to somebody. Wow, my last post was well over two years ago. Time to update the engine and climb back up on the horse to try this activity called writing again.